While others have vented shelves, these are integrated fans in these shelves! Not only are the shelves extremely sturdy, they also feature built-in fans with different configuration options as well as wire management features. 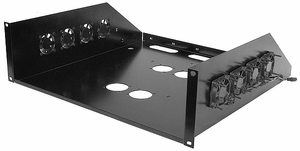 This 3RU shelf features 4-fan assemblies in the sides and two optional 2-fan assemblies in the bottom of the shelf. Each shelf comes with fan assemblies for the sides and the fans for the bottom are purchased separately. The fans can be configured to blow air onto a component, away from the component, or create a cross flow of air. Beyond the concept of integrated cooling and solid construction, these shelves are a tremendous value when considering that it has built-in the equivalent of $180 in cooling products (compared to two 4-Fan Side Coolers). Additional value is created when adding the optional bottom fan assemblies since only fan assemblies are required, not complete units.